Usually when I prepare salmon﻿, I use store-bought teriyaki marinade from the seafood counter and Chris throws it on the grill. Simple as that. But it turns out fantastic every time. Since the weather over here in DC hasn't been cooperating lately, when I wanted salmon the other night I had to figure out a way to cook it in the oven. Surprisingly, I had never cooked it that way before. I usually just eat salmon when I go out to restaurants or when Chris grills it, so this was something new to me. I'm about to make a bold statement, but it's very honest. This is the best salmon I've ever had. Seriously. I devoured it. The dijon mustard adds a little tang and the lemon zest in the panko is a perfect compliment. Drizzle some fresh lemon juice on top and we're in business. It's refreshing and light...a perfect weeknight meal. In honor of Good Friday, I'm sharing with you the best salmon ever recipe. I hope you all have a fantastic, and hopefully sunny, weekend. And Happy Easter to those of you who celebrate it! In a small bowl combine the panko, parsley, lemon zest, 1/4 tsp. salt, and 1/4 tsp. pepper. Drizzle with olive oil and stir until crumbs are evenly coated. Set aside. Place salmon, skin side down, on a board. Brush the tops of the fillets with a generous amount of mustard and sprinkle with salt and pepper. Press panko mixture thickly on each fillet. The mustard should help the panko adhere. Heat vegetable oil over medium high heat in a 12 inch cast iron skillet, or a large ovenproof pan. When oil is very hot, add salmon fillets, skin side down, and sear 3 to 4 minutes. 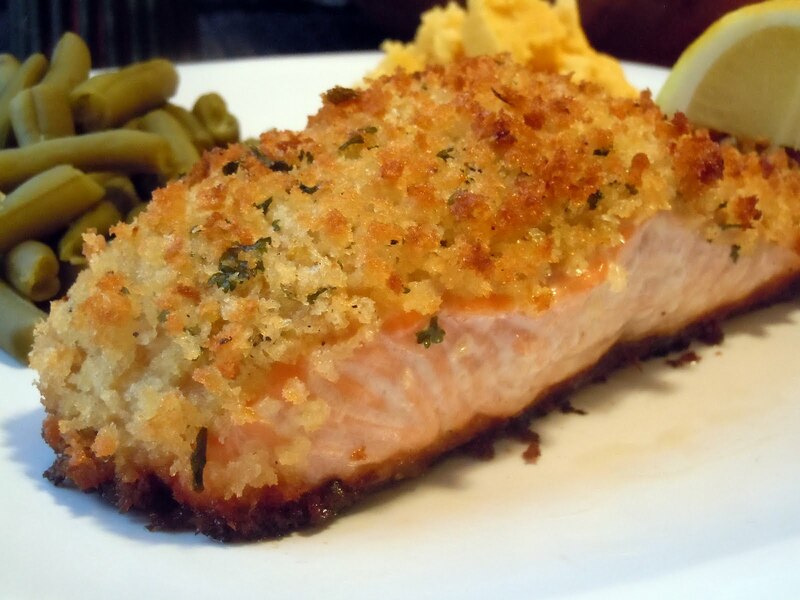 Transfer pan to hot oven and cook for 5 to 7 minutes, until salmon is almost cooked and panko is browned. Remove from oven and cover with aluminum foil and allow to rest for 5 to 10 minutes. Serve with lemon wedges. Yum! I will definitely have to try this, it sounds amazing! I like this one...will definitely try it next time I buy salmon! This sounds great. The finished recipe looks delicious.